The Glow Vest infomercial’s combination of blinking lights and hypnotic, otherworldly background music make it seem like a low-budget 1970s Sci-Fi flick or one of the many videos of the Unarius UFO cult. 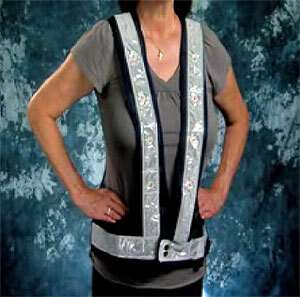 Glow Vest may make you safer but won’t be so safe for all the drivers afraid you’re part of the advance landing crew for an imminent space invasion. Complete the look by adding Slim Suit and YumaLite to your Glow Vest. 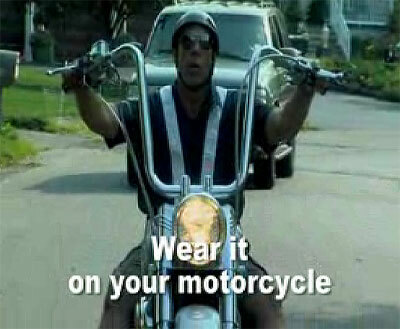 The infomercial touts Glow Vest as perfect for bicyclists, joggers…and motorcycle ridersas if a rugged Hell’s Angel who has spent so much time in biker bars, tattoo parlors, state prisons, and meth labs would throw away his well-cultivated macho image by being seen in a Glow Vest when straddling his Harley hog. 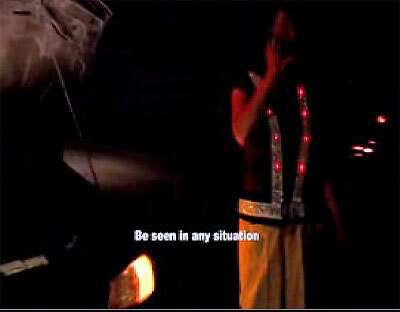 They completely ignore a more likely group of potential customers: Streetwalkers, who would benefit by wearing a Glow Vest and nothing else while trolling for tricks at 2 AM. But nearly anyone desperate to attract undue attention to themselves will benefit from Glow Vest because “one size fits most.” Sorry, Sylvia Browne. “One size fits MOST,” says the announcer, “making it the ideal safety protection for EVERY member of the family!’ Hrm, little flaw in their logic, I think, can’t quite put my finger on it. I can see how this product can be helpful. Ask any jogger.